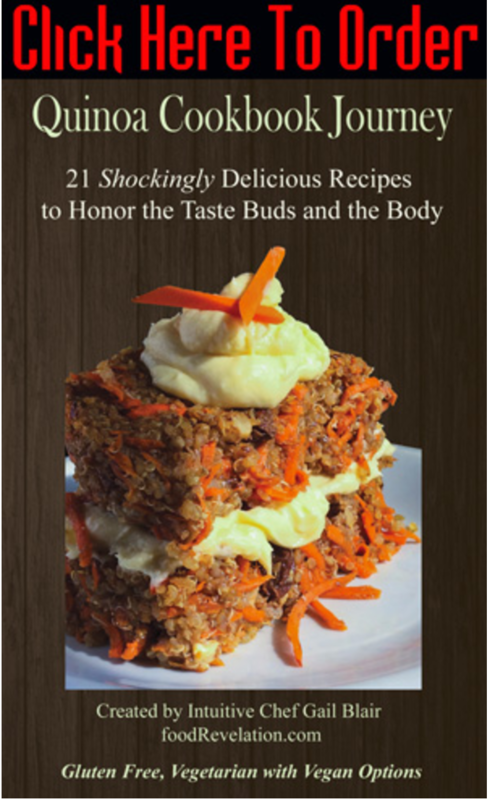 At first glance this book may look like your typical cookbook (if you consider quinoa typical). I assure you it is not. What makes this cookbook unique? It was written by a very creative, Plant-Based Chef turned “Food and Medical Intuitive”. How creative? Intuitive Chef Gail Blair has been lovingly labeled, The plant-based chef for “Meat-Lovers” and “Vegetable Haters”. Her recipes surprise and amaze even the most skeptical, die-hard meat and potato lover; including me. The bonus of her “intuitive gift” is a gift that keeps on giving. If you think “healthy” means suffering through tasteless, cardboard box meals, you are in for a big treat! There is a divine reason Gail was a master chef before her “gifts” kicked in. No-one wants to suffer on the road to health. As a client, I can attest with Gail you don’t have to.